Haq's Musings: Pakistanis Get the Government They Deserve? "The people get precisely the government they deserve"
The above quote is from the judge who handed 14 year prison term to ousted Illinois Gov Rod Blagojevich yesterday after he was found guilty of attempting to sell President Obama's senate seat. I have a feeling that this event will probably pass unnoticed in Pakistan where politics is characterized by a culture of corruption. But for those who have an interest in bringing some accountability to Pakistan's political class, it's an opportunity to understand the evolution of Chicago politics and its comparisons with Pakistan's. While Chicago is a highly industrialized major city in the US state of Illinois, its politics in some ways remains essentially corrupt, sectarian and ethnic like Karachi's. Convicted Governor Rod Blagojevich is a product of the Chicago politics, as were many of his predecessors and fellow politicians found guilty of corruption before him. The obvious difference is that, unlike their counterparts in Pakistan, the corrupt Chicago politicians are being caught, convicted and often sent to jail for their misdeeds. The phrase "Vote early and vote often" captures the essence of corrupt Chicago politics. The phrase has often been used to describe the razor thin win of President John F. Kennedy, the first Irish Catholic president of the United States, in the 1960 presidential contest. It is attributed to vote fraud in Cooke County orchestrated by the then Chicago Mayor John Daley who was himself an Irish Catholic, and thought to have supported JFK because of his shared ethnic and religious affinity with the Kennedys. Needless to say that Mayor Daley was never indicted for anything. Kennedy's rival Richard Nixon decided not to challenge the result to spare the nation of the potential crisis from it. "There was...good reason to stay close to home and in your own neighborhood-town and ethnic state. Go that way, past the viaduct, and the wops will jump you, or chase you into Jew town. Go the other way, beyond the park, and the Polacks will stomp on you. Cross those streetcar tracks, and the Irish will shower you with confetti from the brickyards. And who can tell what the niggers might do?" "Karachi was one of many growing cities made turbulent by ethnic politics. In recent years an ethnic political party has controlled Mumbai, India, imposing a regional language on the government of an aspiring world city. In the growing oil city of Port Harcourt, Nigeria, Internet cafes and churches line the commercial streets, while ethnic militias rule the backstreets and set neighborhoods on fire. None of this will surprise people who study the history of American cities. Chicago, for example, grew explosively from the 1830s onward--it was an instant city in its time--newcomers clustered defensively in their various neighborhoods. As late as the 1950s, immigrants and their children drew battle lines along major streets or railroad tracks.."
It does help to put in historical context the growing pains that Pakistan, and its largest city Karachi, are experiencing now. But it's also important to learn lessons from the way the political leadership is being held accountable for their actions in the United States to help Illinois, and its largest city Chicago, move forward. Let's hope that Pakistan's growing urban middle class will rise to the occasion to meet the challenge of ending the culture of corruption by forcing transparency and accountability at all levels of government in the country. Pakistanis can only expect to have a good government if they truly deserve it. I went to grad school in Chicago. Listening to the news about local corruption, I often thought:this reminds me of Pakistan. Chicago is and will remain corrupt. Catching a few mosquitos from toxic swamp is no panancea. Look also at NJ, the south. rests do not remove corruption. Blagojevich Sentence And Illinois Corruption: Will Things Finally Change? Mayraj: "Catching a few mosquitos from toxic swamp is no panancea." I agree. However, they are catching the big ones. 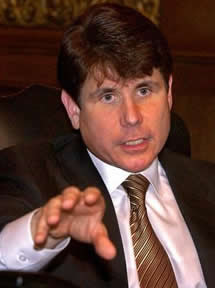 Blagojevich is the 4th Illinois governor in the last 4 decades to be convicted and imprisoned. It should at least have the effect of reducing corruption by making the offenders think twice....a situation better than Pakistan's. He’s been a pitchman for pistachios and a contestant on “Celebrity Apprentice.” Now, ousted Illinois Gov. Rod Blagojevich has become the unwitting face of a discount airline’s fare sale. A day after Blagojevich was sentenced to 14 years in prison on corruption charges, Spirit Airlines announced $14 one-way fares from Chicago to seven cities. It tells customers to buy now or risk missing a “seat-selling” sale. Blagojevich was caught on tape trying to sell or trade the U.S. Senate seat once held by President Barack Obama. Spirit also notes that customers “don’t have to live in the Big House” to buy fares. Blagojevich was barred after his second trial from leaving northern Illinois without a judge’s permission. He’s scheduled to report to prison Feb. 16. The fact that it is the 4th Governor indicates it is not enough. The Republican Governor did his corruption while he was Sec of State. It is corrupt at every level. When corruption is systemic, one person caught here or there makes no difference. They have been known for corruption since at least the 1930s. Same goes for NJ! "Reach as far back into Illinois history as you like and your hands will likely come out dirty. "